Based on my last post What’s for Lunch Today, a number of my readers requested me to post my recipe of the Quinoa Stir Fry. To be honest, it is one of the simplest meals and yummiest food item I have ever prepared. I cook just like a regular fried rice, and replace rice with quinoa. THAT’S IT! I try to make it interesting by adding additional spices. Step 1- Heat some olive oil in a pan. 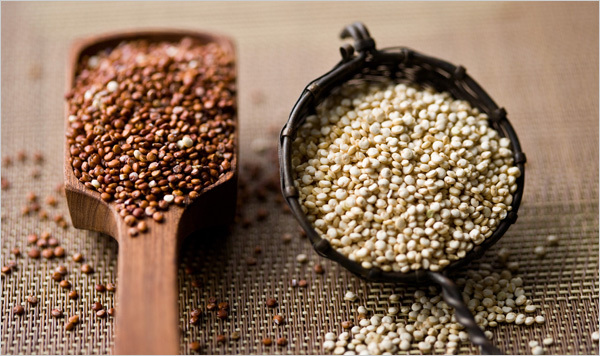 Start cooking some quinoa in a separate pan, but boiling them in water. Step 2- Chop the vegetables to bit size pieces. Step 3- When the oil gets to a decently warm temperature, dump a spoon full of ginger garlic paste in the hot oil. Step 4- Add the chopped onion, and let it cook until golden brown. Step 5- Add the chopped tomatoes and rest of the vegetables, and allow them to cook on medium heat. Step 6- Add half a table spoon of turmeric, coriander and cumin powder, each. Add salt and pepper to taste. Step 7- Now go ahead and strain the quinoa and let it kool for a minute or so. Then add it to the vegetables. Cook until the vegetables have softened. Step 8- Add some lemon juice and soy sauce. Feel free to chop some cilantro and add that for extra zest and presentation purposes. You can make this recipe even more interesting by adding some scrambled eggs, or chicken breast pieces. Please give it a shot and let me know how it turns out.